Poster courtesy of Tropicalia Music & Taco Festival. 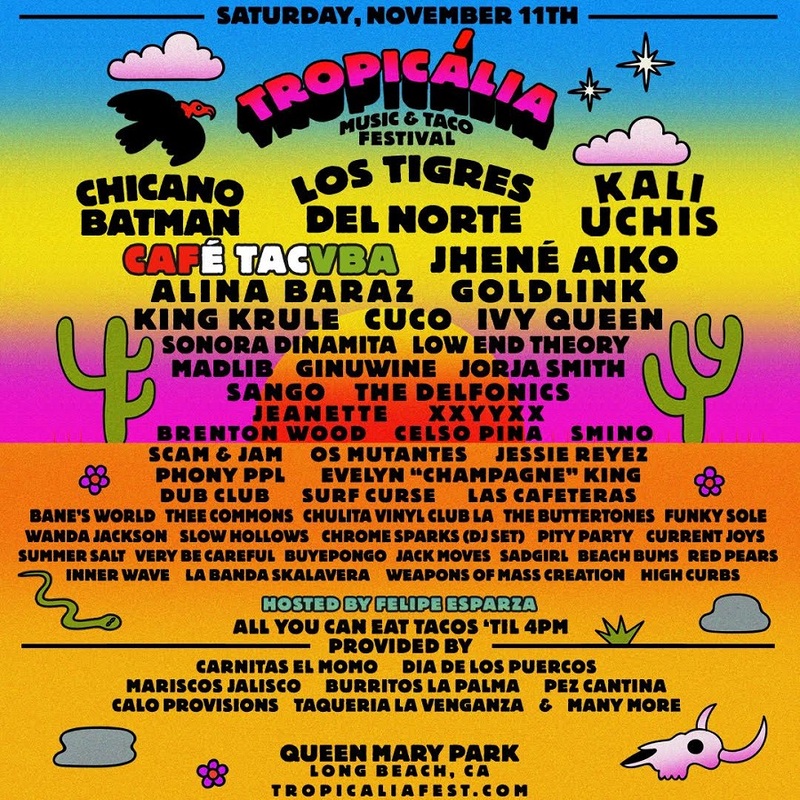 UPDATE | The music and taco festival set to take over Queen Mary Park in November announced Thursday that Café Tacvba, Jhené Aiko, Ivy Queen, Bane’s World, Jorja Smith, Chrome Sparks and Summer Salt have been added to the lineup. Café Tacvba’s eponymous debut album was released in Mexico in 1992 to critical acclaim. The Latin rock band, formed in Mexico in ‘89, is huge in Latin America, has played major U.S. festivals and recently performed at the Walt Disney Concert Hall in association with Pacific Standard Time: LA/LA. 8/21/17 at 5:30PM | Chicano Batman, Los Tigres Del Norte and Kali Uchis will headline during the Observatory’s Tropicália Music & Taco Festival at the Queen Mary on Saturday, November 11, it was announced today. Early bird tickets for the all-ages event will go on sale at 10:00AM this Friday with $75 for general admission and $150 for VIP passes. Also included in the lineup for the all-ages event is King Krule, the young English singer, songwriter, producer and musician whose vibey music is difficult to pin down, but has been described as punk jazz, hip hop and darkwave; La Sonora Dinamita, a Colombian group founded in the 1960s and one of the first cumbia groups to gain international popularity; and Sango, a Seattle native and producer well known for his hip hop, soul-influenced, R&B remixes and beats. The Queen Mary is located at 1126 Queens Highway.